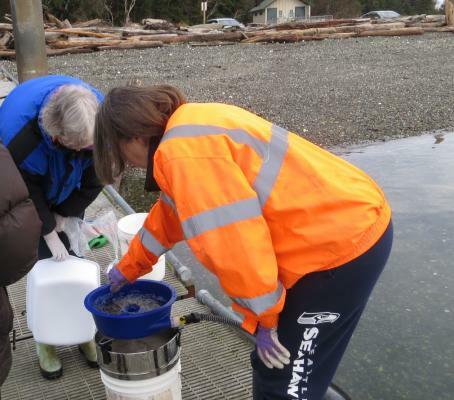 SWS partners with the Island County Marine Resources Committee (MRC) to gather forage fish egg samples at local beaches. 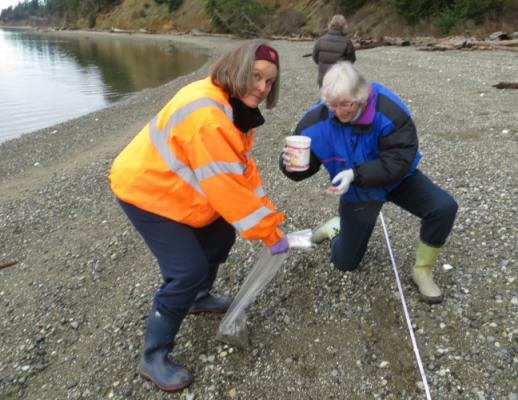 Nancy Hotter ’15 and Sheila Means ’06 gather samples at Camano Island State Park while Ruth Richards ’15, MRC co-lead, fills in the data sheet behind them. Gathering a substrate sample to look for forage fish eggs. After collection, the samples are screened and winnowed to reduce the volume. Sand lance and surf smelt, as obligate beach spawners, are the targets of the survey. Their eggs attach to grains of sand, and are winnowed out of the bulk sample with a “blue bowl” in a technique adapted from gold panning. The winnowed material is then put into a sample jar, to be examined under a microscope, and any eggs tallied. For more information on forage fish and the sampling process, visit WA DFW – Marine Beach Spawning Fish Ecology which has many resources, including this introductory slide show on forage fish, the kinds of beaches where they spawn, and an introduction to the sampling protocol. This MRC article talks about earlier sampling at Cornet Bay on Whidbey Island, in assocation with restoration efforts there and this more recent article talks about the 2015-2016 survey. This entry was posted in Citizen Science, Forage Fish and tagged forage fish on July 14, 2016 by Carol Gillespie & Connie Clark '07.